California saw a decrease in the number of women who died giving birth in 2013, as the maternal mortality rate climbed across the country, according to state officials. But expectant black mothers across the state are still three to four times more likely to die from complications at childbirth than white women. State health researchers say the wide disparity probably isn’t attributed to social factors, such as patients’ levels of education or socioeconomic backgrounds. Instead, they point to evidence of racism and implicit bias in the medical community: A survey of white medical students and residents published in 2016 by the University of Virginia found that roughly half of those who participated believed myths about biological racial differences, including that black patients tolerate more pain and have thicker skin. For more than a decade, guards often resorted to “dipping,” a practice in which a juvenile offender’s arm is twisted behind his or her back before the child is flipped face down with a knee behind the neck, court records alleged. Minors said they were subject to strip searches and cold, filthy cells. They reported broken limbs and scratches on their lips, chins and noses. Cindy Rael was home Wednesday morning watching television when the news turned personal — Gov. Gavin Newsom was halting executions in California, including for the man who killed her daughter Brandi eight years ago, shooting her and lighting her body on fire in front of her children. Five hundred miles north, another mother, Aba Gayle, had made the trip to Sacramento from northern Oregon to meet with the governor. She said she felt grateful for his decision. “What I say is, ‘Don’t murder someone in my name,’ it does nothing to benefit my daughter, it won’t bring anybody back,” said Gayle. After years of living in rage and pain, she befriended the death row inmate who killed 19-year-old Catherine Blount in September 1980 at a home north of Auburn. A landmark California law signed last year to enact the strongest privacy rules in the country and regulate the online marketplace of personal data is caught in a tug of war between industry lobbyists who want to weaken it and consumer groups that say it doesn’t go far enough. The California Consumer Privacy Act, which takes effect in January, will grant people in the state new rights to control the information that businesses gather about them and sell at a time when tech companies such as Facebook, Google and Amazon are facing pressure to change their data collection and advertising practices. But as state Atty. Gen. Xavier Becerra puts together new regulations to implement the law, advocacy groups are seeking more protections for consumers and business groups are working to rein it in, arguing that it will stifle competition and burden companies struggling to comply with a much broader privacy law, the General Data Protection Regulation in the European Union. 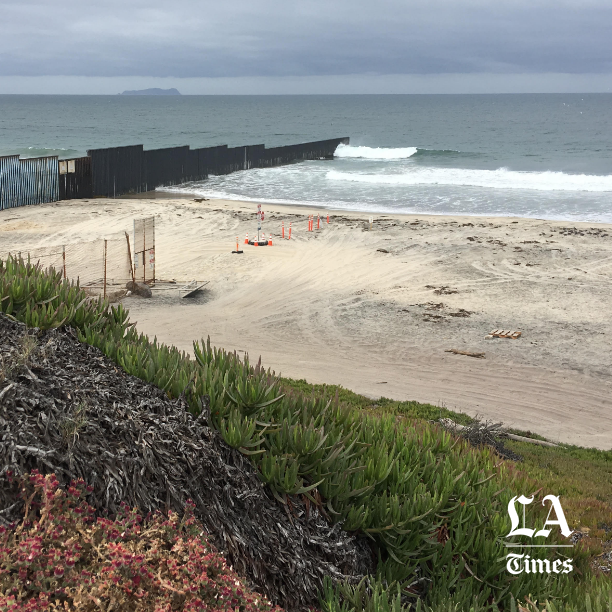 As President Trump pushes Mexico further away, declaring a national emergency to force the construction of a wall along the border, Gov. Gavin Newsom and California lawmakers have made clear they want to draw the country closer. Along with a commitment to reopen a trade office in Mexico City, the governor also plans to revitalize a state commission that would allow California officials to work on issues with their counterparts in Mexican government. And over the course of his first term, Newsom and state Democrats are expected to refocus attention on what they consider the real issues at the heart of the U.S.-Mexico relationship: tackling cross-border pollution, promoting cultural and educational exchanges, and defending the human rights of all immigrants. California Gov. Gavin Newsom said Tuesday that he intends to shift control of the state’s Juvenile Justice Division away from corrections officials to government health and human services providers, a move he called long overdue and necessary to build on past efforts to divert children and teens from a path to prison. Under the proposal, first unveiled as part of his January budget, the California Health and Human Services Agency would oversee more than 660 young offenders, the majority held at a camp in Pine Grove and three detention centers in Stockton and Camarillo. It is a small population compared with the more than 39,000 young people on probation or detained in juvenile halls statewide and the hardest to serve because of the serious charges and mental and medical health needs they face. Corrections and health and human services officials say the plan heralds a cultural change in the state’s approach to the youngest in the justice system, and creates opportunities to better bridge educational, mental health and social services to prepare minors for release. But probation officers, healthcare professionals and community activists who have long been at the forefront of a push to shut down youth detention centers and improve treatment are wary that the changes could merely be symbolic — or worse, halt progress that they say has led to fewer young people in custody. When Gov. Jerry Brown’s final term in office ends next week, he will leave behind a California criminal justice system infused with a new commitment to second chances, a shift away from an era in which tens of thousands — many poor, most black or Latino — were imprisoned with little opportunity to turn their lives around. The governor’s attempt to unwind the old approach stands in contrast to his legacy from the 1970s. Despite a professed belief in redemption, no governor did more to launch the state’s tough-on-crime era — signing a seminal law four decades ago that paved the way for strict sentences, even for nonviolent crimes. Gabriela Cruz, who was brought to the U.S. illegally when she was 1, couldn’t vote, but in the final hours before the Nov. 6 election, she was making one last run to get people to the polls. The sun was setting in Modesto when she found Ronald Silva, 41, smoking a cigarette on a tattered old couch behind a group home. He politely tried to wave her off until she reminded him he had a right that she as an immigrant without citizenship didn’t have. “It could really make a change for us,” said Cruz, 29. Rep. Dana Rohrabacher has lost the congressional seat he held for 30 years in one of the most conservative stretches of Orange County, a stunning defeat for the GOP as other Republicans’ early leads receded in the latest ballot counts, putting the party in fear of losing all six tightly contested House races in California. Republican Rep. Jeff Denham and California gubernatorial candidate John Cox on Sunday called for a repeal of the state’s gas tax increase and underscored the need to expand roads and add jobs. Stumping in Modesto, where Cox’s bus made a stop at Denham’s campaign headquarters, the two made little mention of President Trump in an area where Democrats hold a slight edge in registered voters. Their most passionate pleas were to bring water to Central Valley farmers and to build not a wall along the border with Mexico but greater storage capacity. Lots of shots taken at San Francisco and Bay Area values. “There is a real battle here,” Denham said. One is the world’s richest person, another has been described as a “chain-smokerwho often dresses without socks,” and yet another has changed political parties twice, most recently this year. With the election just around the corner and their party on the defensive, Republicans have railed against Democratic billionaires pouring big money into this year’s midterm. But the top political donors of the closely watched battle for control of Congress are a bipartisan and varied lot. For many Californians, Saturday was a sunny gift of a fall day, a chance to stroll the beach, rake leaves, visit a park or take in a child’s soccer game. For Cristina Escobedo, it was a time to save her daughter from possible deportation. For Marylee Sanders, an opportunity to stand up for Brett Kavanaugh. For Paul Samuels, a chance to learn some newfangled technology and feel as though he was making a difference. Immigrant rights advocates and farmworkers hit the streets early Saturday to get out the vote in the 10th Congressional District, where Republican Rep. Jeff Denham and Democrat Josh Harder are locked in one of the most intense races in California. In this California House race, water is 'lifeblood.' Will an edge on the issue give Republican Rep. Denham a boost? Jake Wenger grows walnuts on land where early settlers arrived in search of gold and instead found rich soil. His orchards just west of Modesto stretch 700 acres and supply a nut company that has remained in his family for four generations. Like other farmers in this congressional district at the northern end of the San Joaquin Valley, Wenger, 34, said he fears his livelihood is under siege by a state plan to reduce the waters diverted from Northern California rivers for irrigation. It’s a tactic that Nunes — along with other Republican candidates — has borrowed from President Trump when encountering coverage he doesn’t like. The new system, which would virtually eliminate the payment of money as a condition of release, could spell doom for not only bail agents, bounty hunters and surety companies across the state, but also a $2-billion bail industry nationwide. Reform in California, which holds roughly a quarter of the market, could prompt other states to follow suit, bail groups and lobbyists said. Reaction has been swift: Just a day after Brown signed the bill into law, bail associations filed a voter referendum in an attempt to block it, asking for support from the very criminal justice groups and activists they’ve long been at odds with. Now agents say they are scrambling to find new careers, closing up shop or weighing whether to move their businesses out of state. "Would you send your children” to one of the centers, Sen. Mazie Hirono (D-Hawaii) demanded of the administration witnesses. None said they would. The calls for help started coming in to immigration lawyers across the country just before Memorial Day. Immigrant detainees, many fleeing gangs and violence and seeking legal asylum in the U.S., were flooding courtrooms along the Southwest border. Dozens were parents reporting that Border Patrol agents had taken away their children, and many were under the impression they would see their sons and daughters again within hours. Nine weeks of chaos and confusion later, many still don’t. A 2-year-old girl, with red sneakers and dark hair, crying as a U.S. Border Patrol agent searches her mother. Boys filing along white tents against a desolate desert backdrop. Toddlers screaming for their parents in a detention center in South Texas. As wrenching scenes of the more than 2,300 immigrant children pulled apart from their parents at the southwest border sparked anguish around the globe and a political backlash at home, President Trump said migrants illegally “infest our country,” framing his policy to separate families as a deterrent against drug smugglers and Central American gang members. In a city most known for its prison and farmland, the modest, one-story home of Mary and Raul Gomez has the feel of the quintessential American dream with its trimmed green lawn, little porch and white picket fence. In the driveway, there’s even a remodeled 1968 black Chevrolet Biscayne visible from Dairy Avenue. As national Democrats play up talk of a wave that could help them regain control of the House, more than a dozen of Democratic candidates are attempting to unseat GOP incumbents in California districts long considered unwinnable. It’s a bold move in a year when skeptics may soon accuse them of sapping resources Democrats need elsewhere.